Thanks to the strong support, AXA Affin General Insurance Berhad (AAGI) recently won big at the Asian Banking and Finance (ABF) Insurance Asia Awards 2016, receiving double awards with the prestigious International General Insurer of the Year - Malaysia and New Insurance Product of the Year - Malaysia. 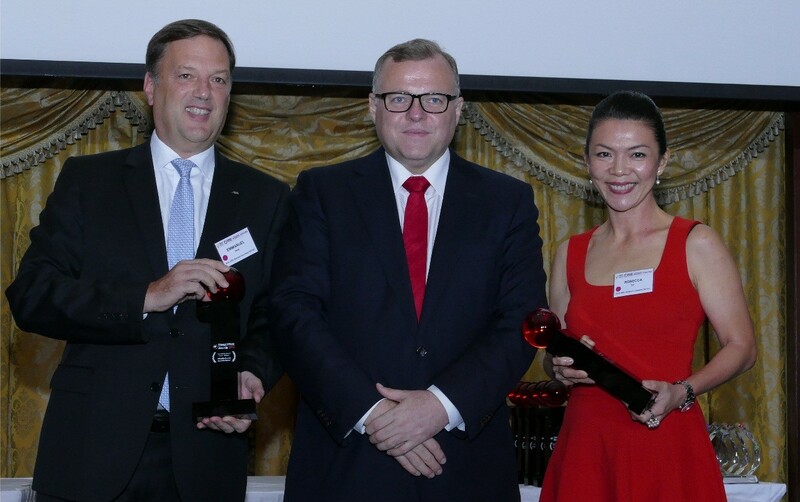 Mr Emmanuel Nivet, CEO of AAGI and Ms Rebecca Tan, CMO and Bancassurance of AAGI received the awards at the ceremony held at Shangri-la Hotel Singapore on 20 July 2016. The first award was the International General Insurer of the Year – Malaysia, awarded to the best general insurance company as voted by the esteemed panel of judges. In 2015, AAGI achieved RM 1.3 billion in Gross Written Premiums (GWP), recorded strong growth of 18% versus the industry growth rate of 2.3%, outperforming the market. AAGI leverages its strong footprint of distribution channels including brokers, bank partners, 23 branches and over 4,100 agents nationwide to offer protection and business solutions, and top-notch servicing to customers. This enabled AAGI to grow to over 1.4 million customers in Malaysia, and currently hold the #1 position in the medical and health insurance category. AAGI was also active in Corporate Responsibility initiatives, with the inaugural AXA Hearts in Action Run 2015 successfully raising over RM100,000 to support WWF-Malaysia’s environmental conservation efforts. The second award received was the New Insurance Product of the Year - Malaysia, for the newly launched GAP-Return To Invoice insurance in 2015, a first of its kind in Malaysia. The plan was developed leveraging AXA’s global network and expertise, and provides a special cover which pays the difference between the claim payout from the main car insurance policy and the original cost of a vehicle. In the case of a claim, the insured will make a claim from the main motor insurance first, then GAP-Return To Invoice will top up the differential amount between the motor insurance claim payout and the original invoice price of the vehicle. With this, the insured will be able to purchase a new car with the combined payout from both the motor insurance and GAP-Return To Invoice. We look forward to your continuous support in 2016!